Published: Nov. 22, 2012 at 05:53 p.m. Updated: Nov. 23, 2012 at 01:34 a.m.
Jim Schwartz knows he messed up. Take a look at photos from the Thanksgiving Day matchup between the Texans and Lions. The Detroit Lions coach admitted Thursday that he "overreacted" when he threw a challenge flag after game officials failed to rule Houston Texans running back Justin Forsett down by contact early in his long, third-quarter touchdown run. All scoring plays automatically are subject to review. If a team challenges a scoring play, it receives an unsportsmanlike conduct penalty. By rule, "the Replay Official cannot initiate a review of any ruling against a team that commits a foul that delays the next snap." A Forsett run that should've went for 8 yards went for 81 -- and it was all on Schwartz. The Lions went on to lose 34-31 in overtime. "I was so mad they didn't call him down," Schwartz said after the game. "I had the flag out of my pocket before he even scored. I overreacted, and it cost us a touchdown. "I was still mad over the first challenge that wasn't overturned, and I thought it was pretty obvious and we didn't get that call. Seemed like we were behind on a lot of calls today." Forsett wasn't about to give the touchdown back, and Schwartz was seen on the Lions' sideline pointing to himself after the crucial penalty was assessed. "I let them (the players) know what the call was and it was my fault," Schwartz said. "Things happen in a game, and we still had a lot of time left. I wanted to make sure they weren't distracted." Dean Blandino, the NFL's director of instant replay, explained the review rule Wednesday on NFL Network's "Around the League." This came up after Atlanta Falcons coach Mike Smith challenged a fumble that automatically would have been reviewed last week. 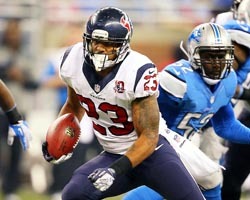 Watch an encore of the Houston Texans' 34-31 Thanksgiving win over the Detroit Lions on Saturday, Nov. 24 at 2 p.m. ET. "The rule was put in place really to prevent a team in a challenge situation from creating a delay," Blandino explained. "They're thinking about challenging the play, they commit a foul, jump offside, false start, now they've given themselves more time to make that decision. "So we tell our coaches, 'Don't throw the flag.' Our officials should get to the sideline, explain to them that the play is not challengeable, and then the replay official is looking at it and he will stop the game and look at it if he deems that it needs to be stopped." It was an ugly moment for Schwartz, who didn't exactly help the cause if his Lions are serious about shedding their reputation as an undisciplined team. UPDATE: Sports Illustrated's Peter King said on NBC later Thursday that the NFL is likely to overturn the rule in the offseason, citing a league source who described it as "too onerous."